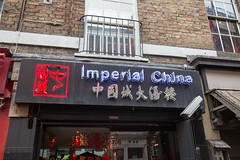 For starters, Imperial China is a rather an impressive location. It’s grown well beyond what was apparently its original well-appointed dining area and kitchen on the ground floor, and both the dining areas and kitchens have had an impressive sprawling growth through the nearby buildings, with dining rooms spread over at least four different floors, and an entirely separate set of elevators and staircases for the staff to move the food about. So after a quick talk with the maitre d’, we ended up in a pleasant but quiet dining room at the back of the building up on the (British) 3rd floor. 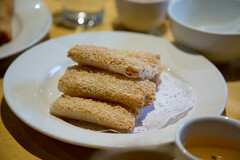 While Imperial China distinctly doesn’t have the old school dim sum carts like some of the nearby places, they do have a very impressive menu of items, all promptly delivered from the kitchen. 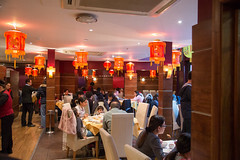 For variety, Imperial China has all the old school dim sum items, with very good range of dumplings, buns, rools, soups, and meats, as well as the occasional smattering of Vietnamese items as well (like Vietnamese-style egg rolls). 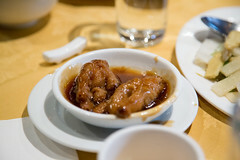 And really, everything was very nicely executed: the chicken feet (not exactly the sort of item that my parents order, but the rest of us enjoyed them a fair bit) were particularly nicely sauced and cooked to tenderness. The spring rolls we also good, with the shrimp spring rolls with sesame being particularly nicely done: a rich and flavorful filling of both whole and pureed shrimp, these were delicious, tender morsels of flavor as you popped them in your mouth. Similarly, the steamed pork buns had nice fluffy exteriors, and a nicely seasoned pork interior just teeming with that “Chinese BBQ” flavor. 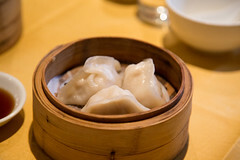 Add in some perfectly steamed dumplings, juicy and soft but not sticky or gummy, and I have to say, while I miss the dim sum carts, they’ve certainly got a a quality product going here. I can definitely see why the place is popular enough to have so many dining rooms, and so many rave reviews.